Update 22/04/2013: The error in the Little Blue Car Pattern (row 12 of the side panel) has now been corrected. I have absolutely no idea how I managed to mess that row up so royally and apologize to everyone who tried (and failed) to make this pattern. Please, if you have downloaded this pattern previously, do so again now so that you have the correct instructions. If you pick up any other errors, please let me know. We had Pieter’s birthday party this weekend. What a lot of hassle for 2 hours of yelling kids! But he loved it and I was very chuffed with how it all came together. Watch this space for my Superhero Pop Art Printables etc. My mother-in-law was such a great help!!! And not just with the party. She has been doing a load of washing a day AND the dishes in the evenings. To mention but two of the perks of having them visit. I think she will want a week’s rest when she goes back to South Africa. They have headed off to Scotland for two days, so the husband and I are getting some jobs done. Pretty soon we will both be back at work en then what are we going to do??? And on the way back from nursery Pieter told me he has a girlfriend. Apparently he “sat next to her and held her hand ALL through circle time”. He’s only 4, bless him. 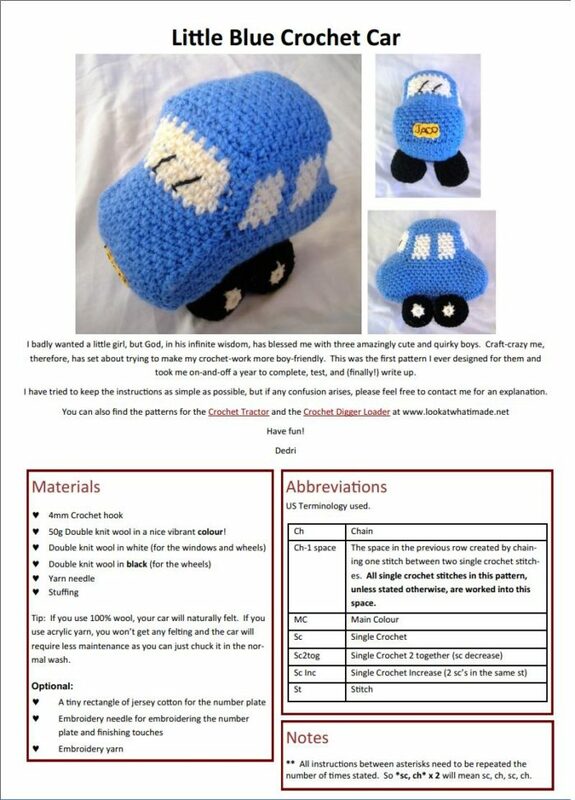 Click on the image below for the FREE Little Blue Car Crochet Pattern PDF. You can read more about the Little Blue Crochet Car here. 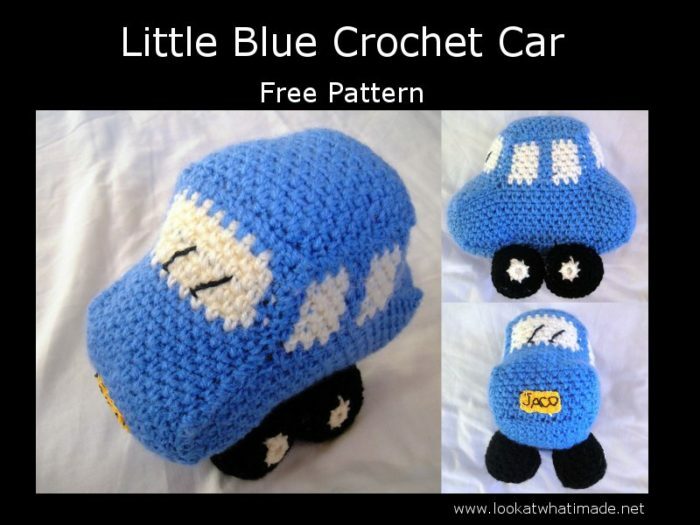 The little blue crochet car is made using the linen stitch, which is basically a mesh of *sc, ch-1, skip 1*. If you have never used the linen stitch, or would like a bit more help on how to make it, please see this photo tutorial. Thanks so much for the digger, car and tractor patterns. It is so nice of you to put them on for free! They are SO cute! My Grandson will love these! I’ve made both of the sides according to the pattern I got when I clicked on the picture, but they’re not right. I see that you’ve corrected row 12, but I don’t think the pattern that we get is corrected. The windows don’t end up in the middle of the sides, but to one end. Thank you!! I found the FREE pattern!!! ♥ it!! !